The Scubapro Travel Bag was made for travelling. With its 2 in 1 gear transportation system which is the ideal bag for divers which travel light. Members earn 330 Points on this purchase! 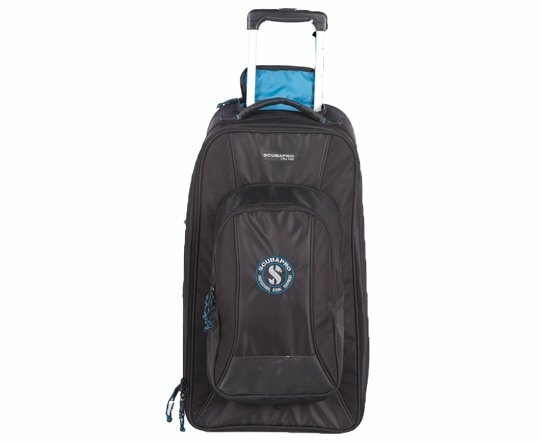 This sturdy mid-size rolling bag is perfect for dive traveling. Featuring a two-piece system, the removable backpack lets you keep your valuables with you on the plane while the main bag keeps clothes and dive gear safe and secure. The idea is, when you’re heading for the airport you keep the two parts of the system together; that way, you have a single piece of luggage that rolls easily and offers one-hand control with the substantial double-bar tow handle. When you reach the baggage counter you check the roller bag, unzip the backpack and carry that onto the plane with you. Once you get to your destination, zip the two bags together and you’re ready to roll again. The bag includes a choice of side and top handles for easy lifting into overhead bins or onto airport customs tables. Inside lining is made of 150D polyester/PU. Double bar tow handle provides solid control when rolling the bag through busy airports. Side and top handles allow for easy lifting into overhead bins or onto airport customs tables. Removable backpack lets you choose between carrying it separately or zipping it onto the main bag.